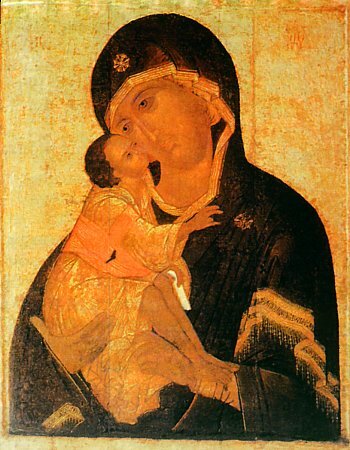 The Donskoi Icon of the Mother of God was written by Theophan the Greek. On the day of the Kulikovo Battle (8 September 1380, the Feast of the Birth of the MostHoly Mother of God), the Icon was amidst the Russian army, giving it help, but after the victory it was passed on by the Don Cossacks as a gift to their commander, Greatprince Dimitrii Donskoy (1363-1389), who then transferred it to Moscow. The Icon at first came to be at the Kremlin Uspensky Sobor (Dormition Cathedral), and later at the Blagoveschenie-Annuniciation Cathedral (the Icon is now in the Tretyakov State Gallery). In commemoration of the victory on the banks of the River Don it was given the name of the Donskoi Icon. In the year 1591 the Crimean khan Nuradin and his brother Murat-Girei invaded Russia with a numerous army, and advancing on Moscow, they positioned themselves on the Vorob'ev hills. For the guarding from enemies, around Moscow there was made a church procession with the Donskoi Icon of the MostHoly Mother of God. On the day of battle it was situated in the military chapel amidst the soldiers ranks and set the Tatars to flight. In thanksgiving to the MostHoly Mother of God for Her mercy, manifest through the Donskoi Icon, in 1592 at the very place where it stood amidst the soldiers was founded the Donskoi monastery, into which was put the wonderworking icon and feastday established under 19 August. By established custom, in the small cathedral in honour of the Donskoi Icon of the Mother of God, once every four years His Holiness the Patriarch of Moscow and All Russia performs the rite of the boiling of holy chrism.